I have several readers that visit this site from Canada so I thought that I would dedicate this post to them for their continued support and friendship. I found Ontario obits website where you can research for your ancestor that has passed away in Ontario. The site provides an index for you to research within. Once you have located your ancestor, you then contact one of the volunteers to assist you with your request. 2. Copy and paste the exact index line into your email request - Please DO NOT retype the index line into your email as it may result in errors. If the index you are looking for contains *JFLH please visit "Jude's Family & Local History" to obtain that obituary. 3. Send your email along and it will be processed as soon as possible. I would suggest that you check out the FAQ section where Janet discusses answers to common questions regarding the site and how it is set up. I found the site to be easily navigated and the FAQ section answered many of my questions. 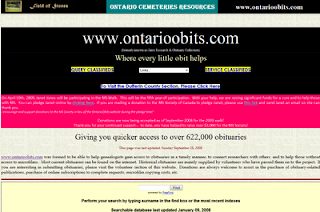 If you would like to research on this site, click Ontario Obits. Have fun searching! Sadly the web page has been suspended I think it happened once before and she got it up and running, I think its expensive to run.